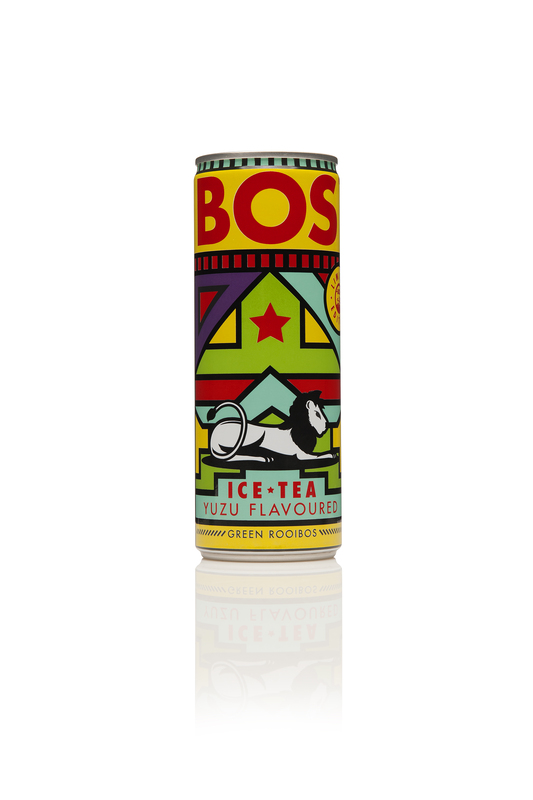 BOS Ice Tea has long been a loyal supporter of the creative industries so when they launched their Design-A-Can campaign in August last year, it marked a major step for the local ice tea brand’s involvement in the design community. To celebrate the official launch of the winning limited edition BOS can, there’s an exhibition in Cape Town at the Spin Street Gallery coinciding with First Thursdays on the 7th May 2015. Along with the new can, BOS will also be showcasing the other top design entries. The can design winner, Ofentse Letebele, beat over 700 entrants to take the prize and was interviewed by founder of BOS, Grant Rushmere – check it out here. Ofentse’s design stood out to BOS when judging the entries for its modern spin on what is essentially a very African design and it looks great as part of the BOS family. The winning can design has been paired with a new flavour for a limited time only: green rooibos ice tea with Yuzu. Yuzu is an innovation in the South African market, an emerging ‘super fruit’ with a delicious citrus flavour and green rooibos is a twist on traditional rooibos, packed with more anti-oxidants.